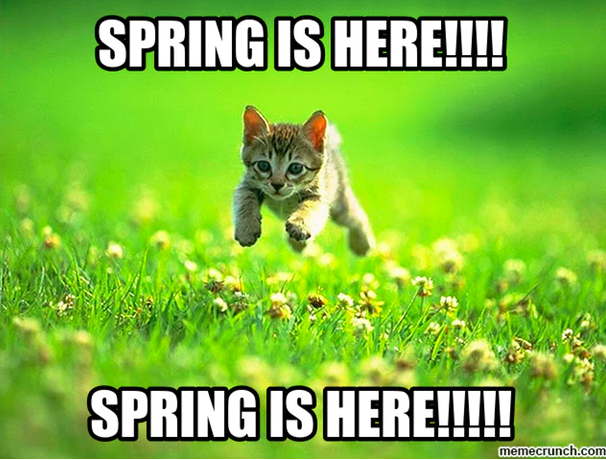 Welcome to the first full week of spring in 2019! We made it. Actually aside from a few weeks of snow, I didn't find winter to be too bad. It was tolerable and we weren't too burdened by the snow and cold. But that's over now, so welcome spring! Chirping birds. I really noticed the lack of birds this winter; I'll be happy to welcome them back to our yard. I wish we could put out a feeder but the squirrels (and racoons) are relentless so the birds don't even benefit. Asparagus. I know you can get asparagus all year round but it is always the first Ontario vegetable that comes out in the spring and I like making it- roasting in the oven, pan frying or adding to a pasta. Opening the windows in the house. It is so nice to get a breeze blowing through the house, even if it's still a little cool. Easter. It is my very favourite holiday. Light and warmth in the evening. A quick walk or bike to the playground is one of our favourite things to do. Rubber boots. I have tall Hunter boots and short Sorrel boots and I love them both. I wear them anytime I get the chance. So happy for spring. Unlike you, this winter hit me hard! I love Spring too! And yes, I love my Hunter boots this time of year!